A series of research-based conferences and seminars was recently organized in preparation for the commissioning of the King Abdullah Cancer Center, where all multi-disciplinary services will join hands and share expertise in the treatment and management of cancer patients within the Gulf region, with the underlying goal to become a world-leading cancer center. 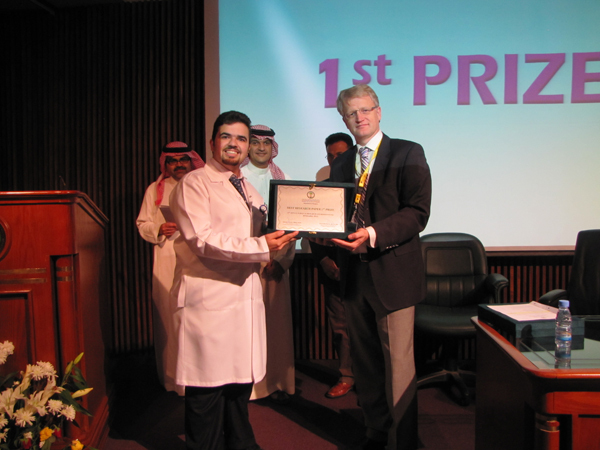 The event took place on Nov 6-8, 2012 and was held at the Postgraduate Center at King Faisal Specialist Hospital and Research Center. It was attended by many surgeons, residents and scientific delegates. The attendees included Dr. Dieter Broering (OTC Director), Dr. Abdulaziz Jarman, Dr. Suleiman Al-Omran, Dr. Khaled Alkattan, Dr. Nasser Al Sanea, and Dr. Luai Ashari. The first two days were dedicated to speeches from surgeons and oncology researchers. The third day was the 12th Annual Surgical Research and Residents Day opening the floor to residents and students to present their novel research abstracts in the fields of oncology and surgery.